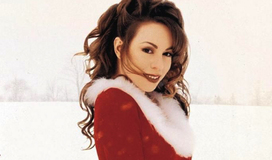 Mariah Carey's 100 Million views for "All I Want For Christmas Is You" tops YouTube´s Chart. A vocal tour de force, an immaculate composition and a fan favorite, it has become the top-selling digital holiday song of all time, the inspiration for countless covers and -- having just re-entered the Billboard Hot 100 for the seventh time, a pop hit for the ages. Mariah's AIWFCIY Concert series will now begin on December 2 at New York City's Beacon Theatre. Read the announcement here. By popular demand, two dates have been added for Dec 1 &amp; 2 in NYC. HBF presales begin TUE, 10/31 @ 12-noon ET. 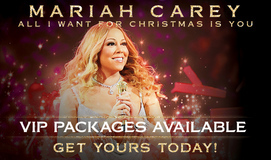 Fans can enjoy a festive VIP experience to celebrate the holiday season and classic songs at Mariah's AIWFCIY concerts! Mariah is making a return visit to New Zealand and Australia in February 2018 with her #1s Tour. Fans can take part in exclusive HBF ticket presales! Mariah has added new dates to her Christmas concert series in North America. HBF presales begin today, 10/3 @ 12-noon local times. 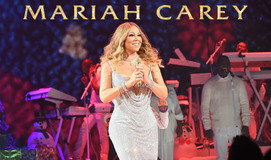 Paris concert added to Mariah's Christmas concerts in Europe. HBF presales are scheduled to begin 2 October @ 10am local time. Special release comes out October 20! Learn how you can pre-order the special collector's edition Butterfly 12" vinyl picture disc featuring the album's iconic cover photo. Mariah is bringing her "All I Want For Christmas" Tour to the United Kingdom in December 2017! Find out how to get preferred tickets early. 'All I Want For Christmas' concerts announced for The Colosseum at Caesars Palace in Las Vegas! HBF presales begin 7/19 @ 12pm PT. Get your Live Pass for access. Mariah Carey has a new show date, set for 10/14 at Foxwoods Resort & Casino in Mashantucket, CT. Register for a Live Pass to access our presale that begins on 6/1. Award winning music icons Lionel Richie and very special guest Mariah Carey announce their "All The Hits Tour" for 2017. Presales begin MON., 12/12 @ 4pm local times. Four weekend dates added for Mariah's #AIWFCIY concerts in NYC, on Dec. 10 & 11 and Dec. 16 & 17. HBF presales begin 11/9 @ 11am ET. 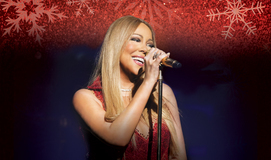 Mariah returns to New York's Beacon Theatre this holiday season for limited-run Christmas-themed concerts. Ticket presales begin 10/18. Public on-sales 10/22. Fans have a new opportunity to experience Mariah's #1 To Infinity performances, scheduled for Spring 2017! Honey B. Fly presales begin Tues., 9/20 @ 10am PT. Don't miss our special members-only ticket presale for Mariah's Sweet Sweet Fantasy 2016 Latin America Tour. Presales begin tomorrow, Wed., 7/27 @ 10am local time. The Latin American leg of the Sweet Sweet Fantasy Tour arrives in Buenos Aires on Oct. 28, continuing throughout Latin America in November. 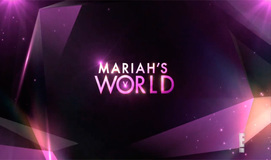 Check out the new promo video for the upcoming docu-series, MARIAH'S WORLD. Mariah returns to Las Vegas on June 7. There's still time to secure a special ticket package to experience MARIAH: #1 TO INFINITY! New documentary series, Mariah's World, will provide VIP access to the pop icon during her highly anticipated Sweet Sweet Fantasy European tour and whirlwind fairytale romance. The 2016 Essence Festival New Orleans announces its first-round lineup, featuring headlining performers including Mariah Carey. We've awarded front row seats for Mariah's final #1 To Infinity performances in February. Find out who the lucky Lambs are! Enter our latest sweepstakes for your chance to win FRONT ROW tickets to see Mariah perform live in Las Vegas on Feb. 17, 19 or 20! Get details now.